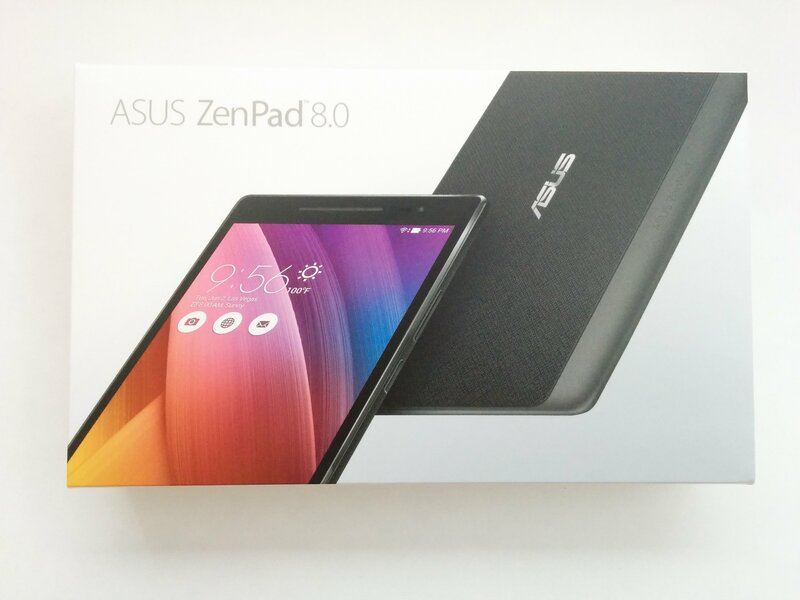 The ZenPad 8.0 is part of a new tablet rebranding and direction by Asus which was created to replace the MeMO Pad, Fonepad and Transformer Pad tablets. 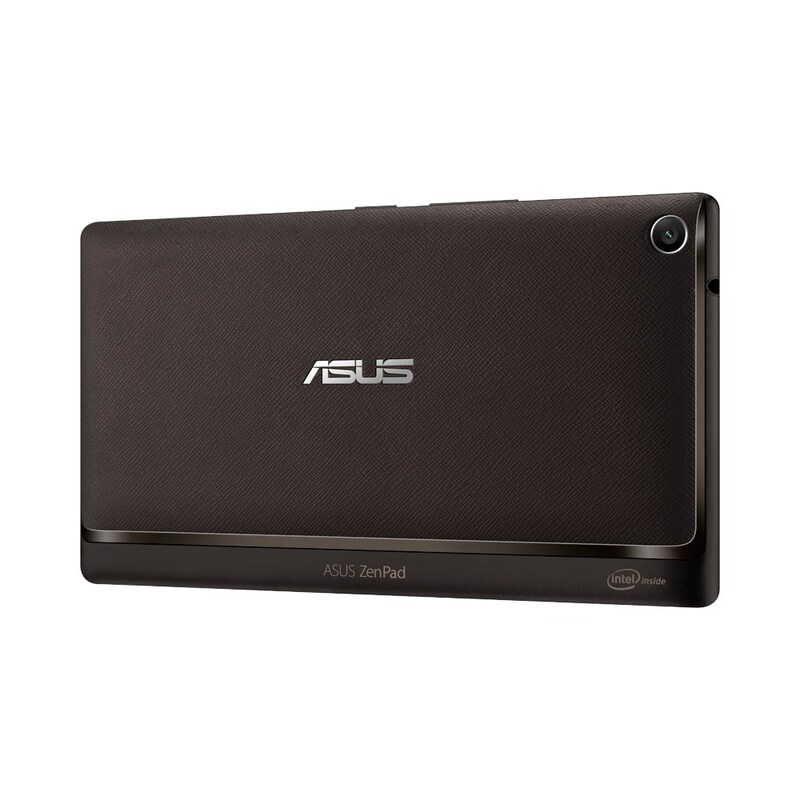 Asus wanted a more streamlined approach with their Android tablet branding and have settled on ZenPad. This new line-up covers a range of tablets with different sizes, price ranges, and features. A slogan Asus lives by is “empowering luxury for everyone”. This ultimately means Asus prides itself on selling affordable products while maintaining a great user experience. More than just great prices, the Asus “Zen” branding also means a premium design. So when you boil it all down, ZenPad tablets offer a very affordable price while maintaining a premium look and feel. 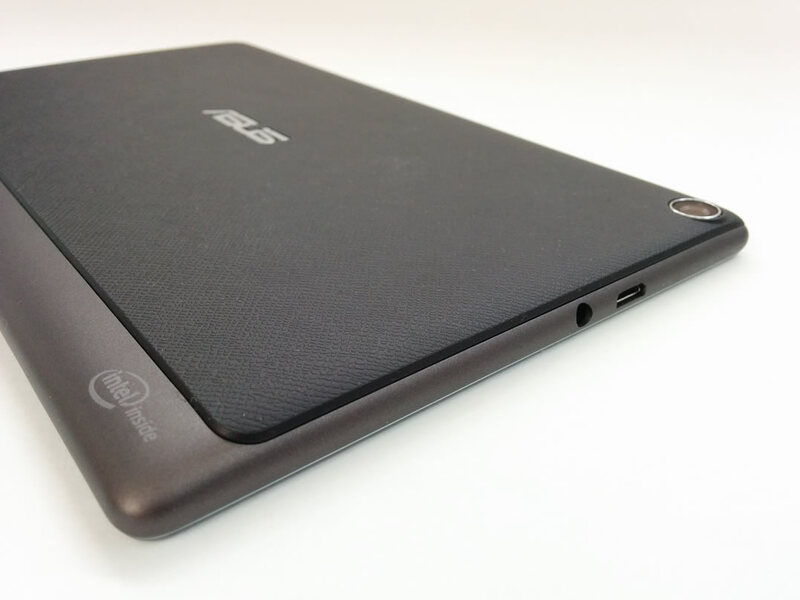 The ZenPad 8.0 is a great example of premium looks with an affordable price. 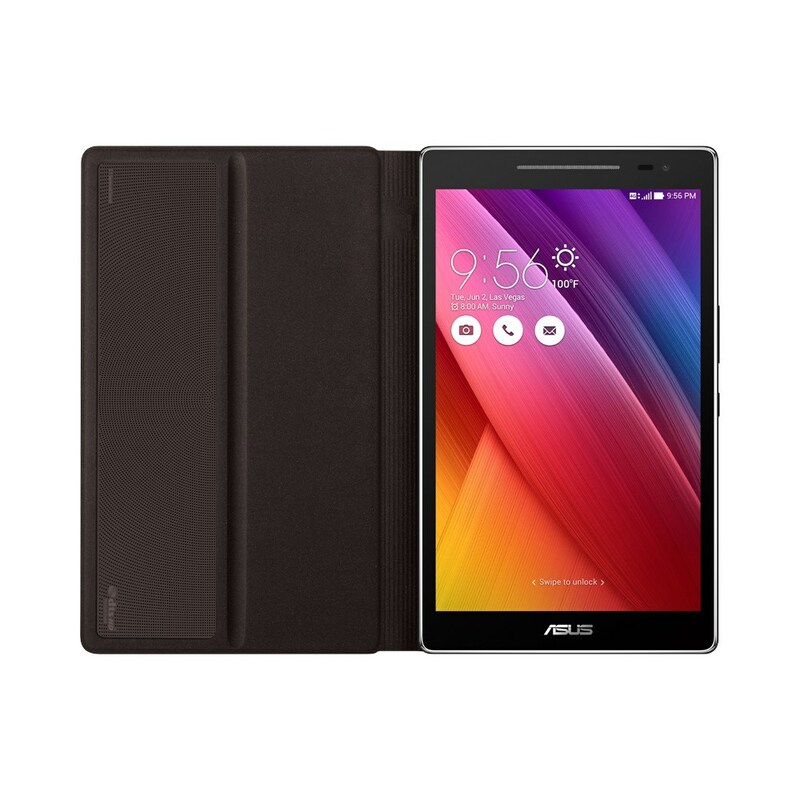 So in terms of affordability, the Asus ZenPad 8.0 comes in with an extremely competitively price. You can buy the ZenPad 8.0 (Z380CX) model for as low as $129 US. 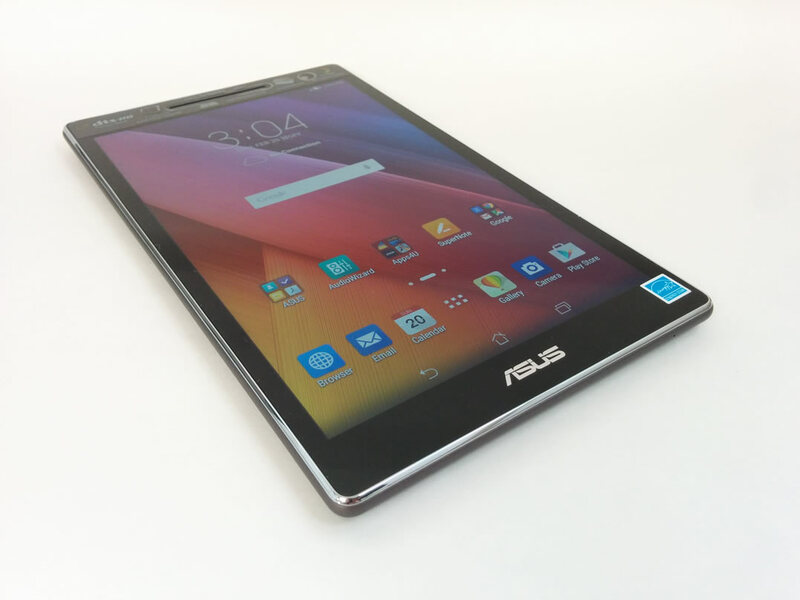 If you look at the competition in the 8-inch tablet space, Asus is right there among the most affordably priced. 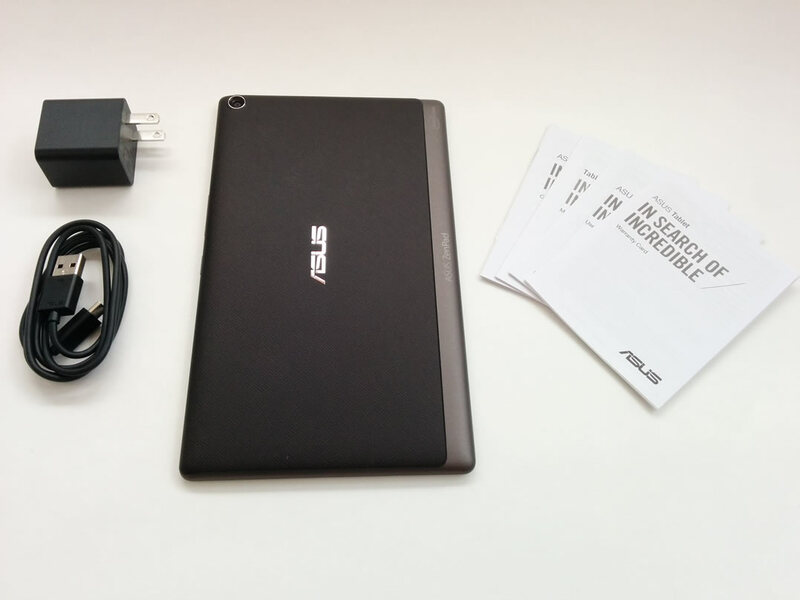 Price is one thing, but Asus created a very unique and customizable design which has never been seen in the tablet space before. 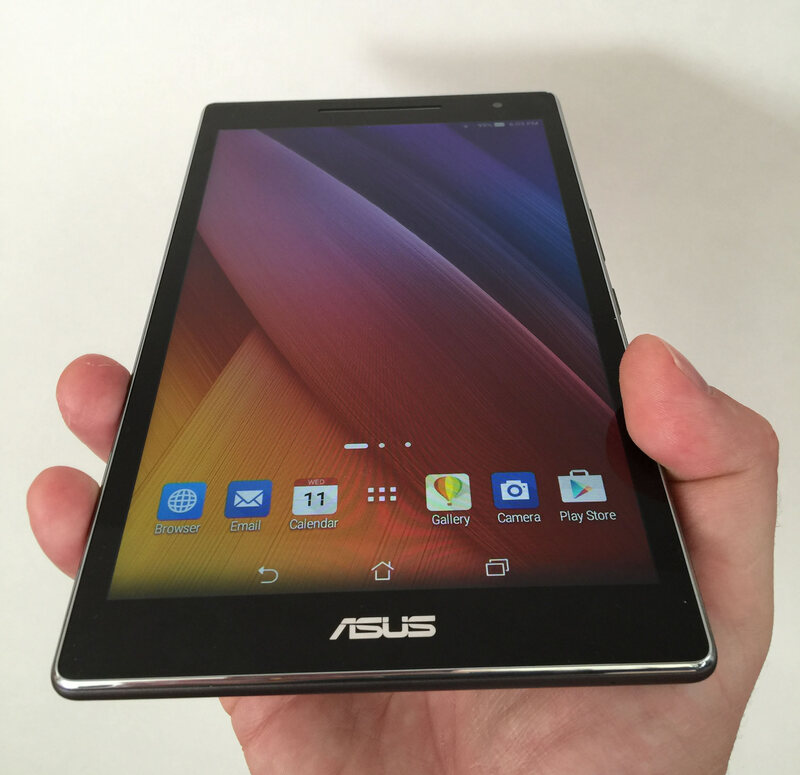 The ZenPad 8.0 is part of a new innovative design by Asus that the company describes as “interchangeable”. What does this mean exactly? 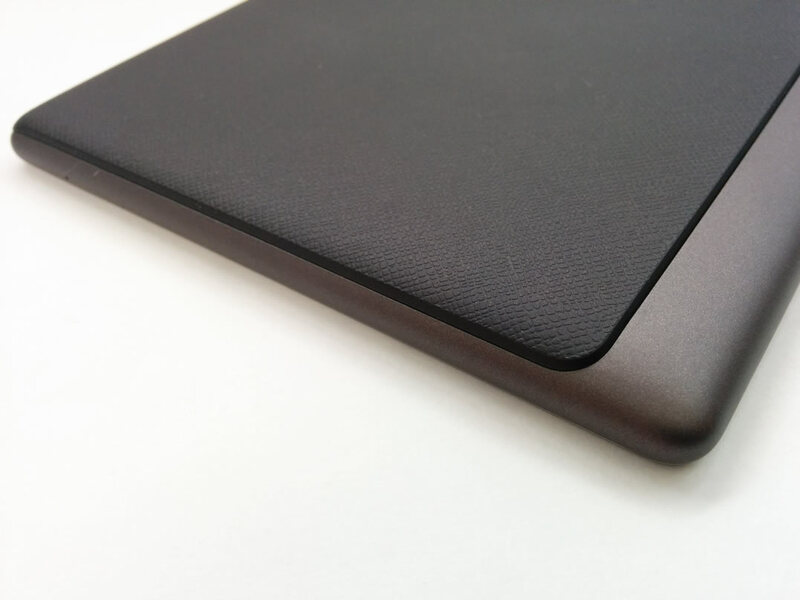 It means that the ZenPad 8.0 has an easy to remove back plate which can be swapped out with some innovative custom cases and covers built specifically to match the design and style of the tablet. Call it a seamless design if you like. These accessories are a big selling point of the ZenPad 8.0 and I will get into details within the review. 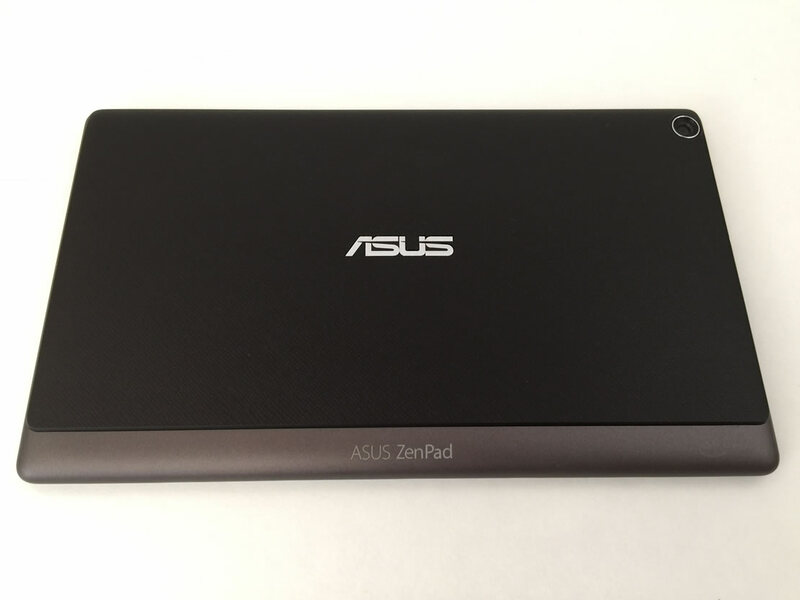 We mentioned previously that the ZenPad branding has replaced the Fonepad tablets. It’s worth pointing out that the ZenPad 8.0 that we are reviewing also comes in a 4G LTE version which has voice calling. So in a sense this could be considered the next generation 8-inch Fonepad. That particular model is the Z380KL and features a Snapdragon processor which makes it even more different from the Intel Atom powered model that we are reviewing. So if you like what you see in this tablet, check your market because certain areas of the world will have the 4G LTE model available. Important Note: Beware of the different ZenPad 8.0 variants that exist on the market. Our review model is the North American version, the Z380CX which has lesser camera specs but 2GB of RAM instead of 1GB of RAM. Some markets have a Z380C model which has better camera specs, but come with only 1GB of RAM. This is an important detail especially if you are basing your purchase decision on reviews that were for a version of the ZenPad 8.0 which is not even available in your country. Some countries may have a Z380C model with 1GB of RAM and a different country may have a Z380C model with 2GB of RAM. You may also see the Z380KL which is a 4G LTE version of the ZenPad 8.0 and it has a Snapdragon processor and 2GB of RAM. The Z380KL also has a configuration where the rear camera is either 8MP or 5MP and the front camera is 2MP. Just check the details if you’re looking at other ZenPad 8.0 reviews and see if it’s a model/version that’s available to you in your country. 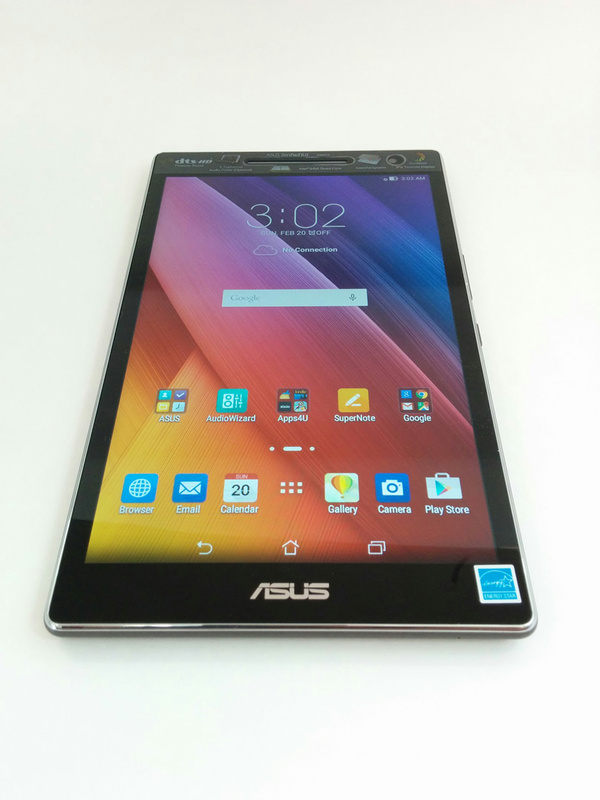 Asus has one goal with their ZenPad line-up. They wanted to create beautiful designs with low price points. It was quite clear upon unboxing and holding the ZenPad 8.0 that Asus achieved their goal. The ZenPad 8.0 is a budget priced tablet, but design wise it doesn’t appear as a budget device. A $129 tablet that has a premium look. 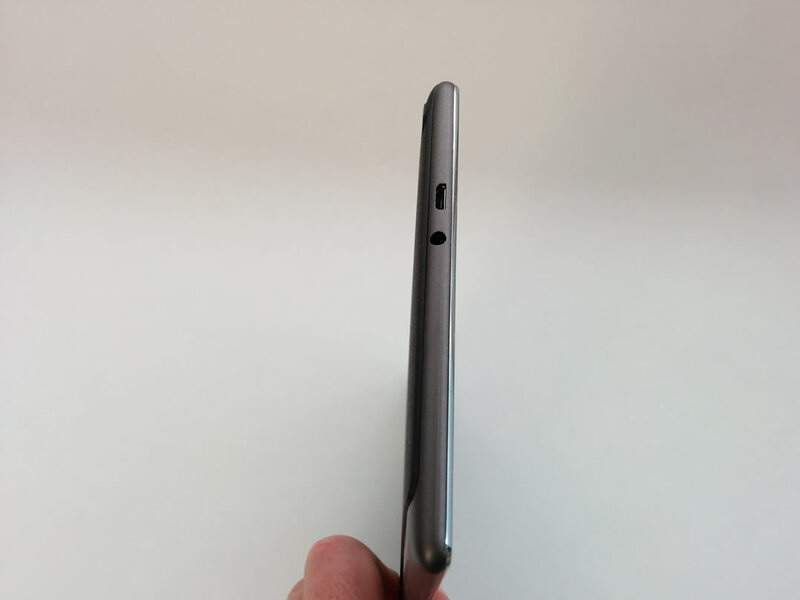 From the top of the tablet there is a nice chrome strip accent that runs around the top edge. On the rear there are two different textures, but the majority of the back is a contoured plastic which gives a classy appearance. There is a smooth strip that shows the Asus ZenPad logo and it runs around the entire side of the tablet. Overall it feels nice in hand and is a comfortable size and weight. 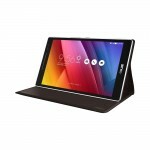 The volume rocker and power button are located on the same side of the tablet and both provide a nice clicky response. In comparison to the ZenPad 10 and ZenPad S 8.0, the ZenPad 8.0 buttons had the better feel and response. 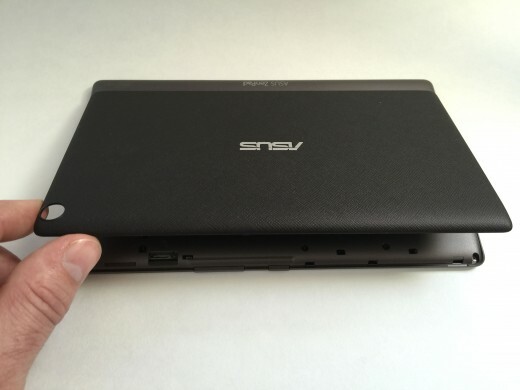 The charger port is in an odd spot on the top of the tablet rather than at the bottom. It’s a bit counter intuitive at first, but it’s actually better that way for using the tablet while plugged in. There is a long speaker grill at the top of the display and this gives the ZenPad 8.0 a distinct look in comparison to the other ZenPad offerings. This is a single speaker so you aren’t going to have quite the same audio experience as the dual stereo speakers that are found on the ZenPad 10 and ZenPad S 8.0 tablets. The ZenPad 8.0 fits comfortably in one average sized hand. 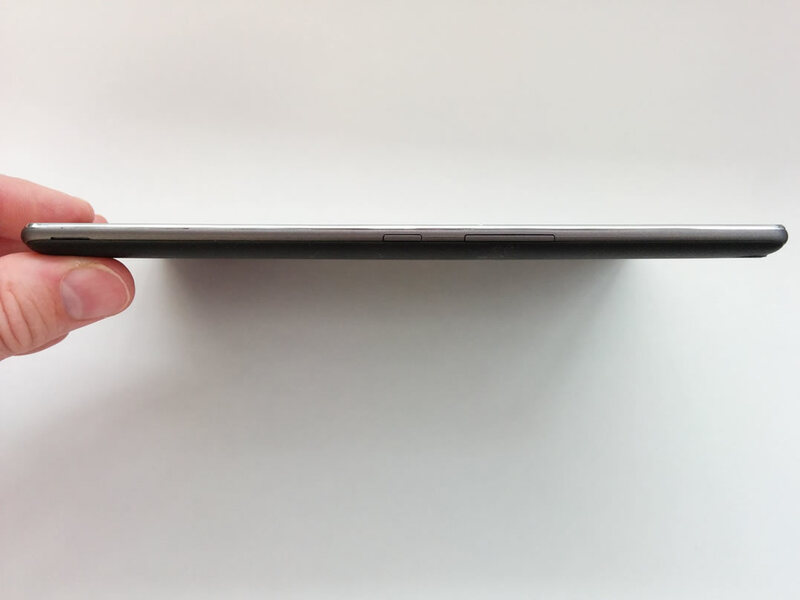 Weight wise and thickness wise, the ZenPad 8.0 is very reasonable. I didn’t find it heavy or cumbersome over long periods of continued use. Sure the $199 ZenPad S 8.0 comes in quite a bit lighter and thinner but there is a big price gap between the ZenPad 8.0 and ZenPad S 8.0 tablet. One of the big selling points of the ZenPad 8.0 (and ZenPad 7.0) is a design feature called interchangeable design. None of the other ZenPad models have this design. What this really means is that the rear panel (back plate) is easily removed. Asus offers three different styles of case/cover accessories that snap into place and ultimately replace the original back plate. 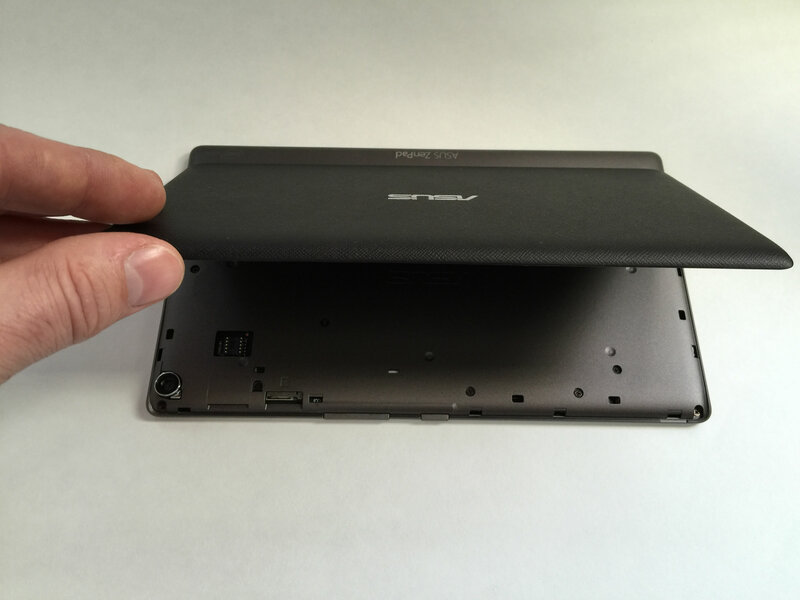 It’s simple to remove the ZenPad 8.0 back plate. 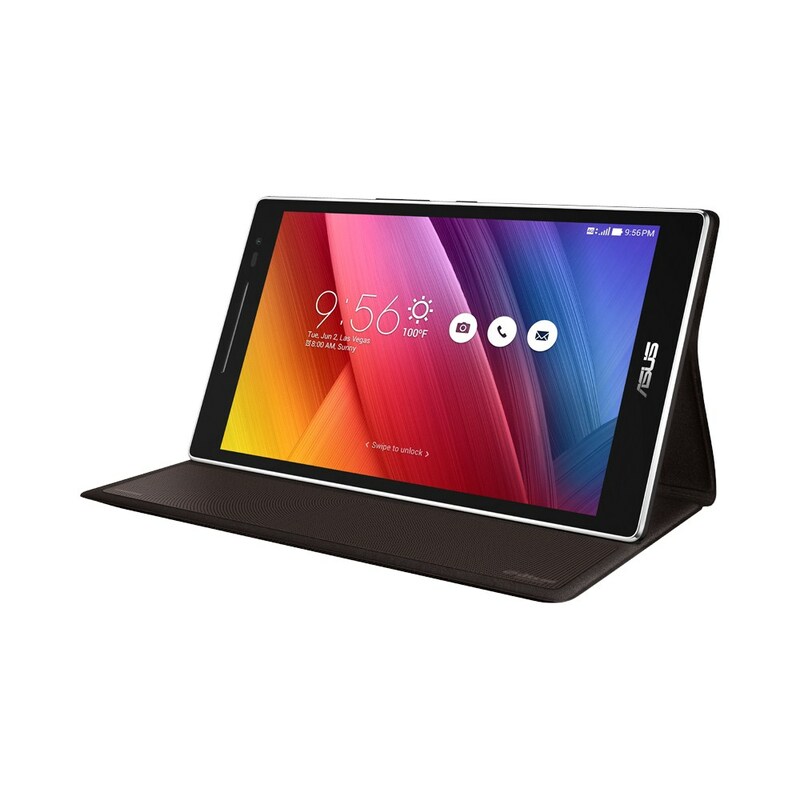 What makes this design so great is that these accessories match seamlessly with the style of the ZenPad 8.0 tablet. The trouble with a lot of tablet cases and covers is that they add a lot of bulk and don’t match the look and feel of the tablet. 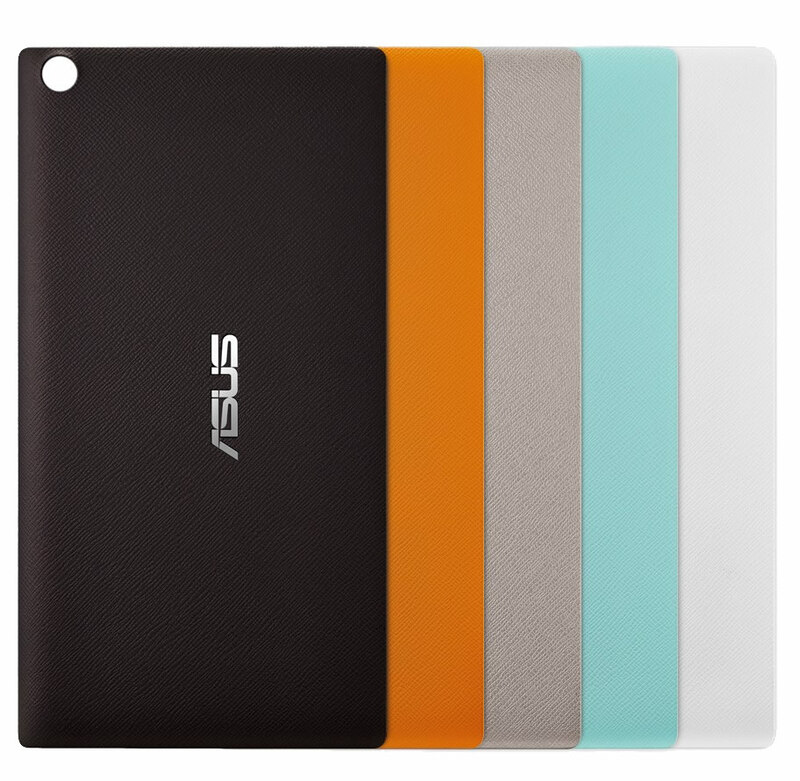 These Asus interchangeable cases and covers change all that by keeping a slim profile and providing a super snug fit. The cheapest accessory is the Zen Cover which is simply a $9.99 US back plate replacement which comes in a wide range of different colors. The color options include: Black, White, Aurora Metallic, Blue, and Orange. These are simple to snap in so that you can color coordinate for those times you’re out and about with the tablet. The next most interesting accessory is the Power Case which is essentially a back plate with a battery. This can provide an extra battery which will gives you a combined battery life of around 16 hours in total for your ZenPad 8.0 tablet. There are two battery level displays on the ZenPad 8.0 when utilizing the case so you know the battery level of the case and the tablet at any time. The most intriguing accessory though is the Audio Cover which is a cover that has a 5.1 speaker system built into it and includes a sub woofer. It’s ingenious really. Audio performance is very impressive on the ZenPad 8.0 so having a case like this really make it a serious movie player. As much as I can describe these accessories, it’s unfortunate that I don’t have these available as part of this review. I am hopeful that I can provide accessory specific reviews in the near future. In particular I’m very interested in the Audio Cover. The resolution of the ZenPad 8.0 is 1280×720 which in part has allowed Asus to reach a low price point. Yes it’s not at the 1080p level, but it does 720p HD resolution very well. With a $129 price tag, you can’t expect the ZenPad 8.0 to be like the $199 ZenPad S 8.0 which comes with a high resolution display. It’s more than enough resolution to be satisfied with this purchase. On the 8-inch display the resolution is more than sufficient. I found games, videos and images to look sharp and bright. Overall brightness is great, but I wouldn’t expect it to beat the higher priced competition in benchmark tests. Text crispness is clean and smaller text is still easy to read, although some sharpness is lost on small text like in the menus. The ZenPad 10 (10-inch) shares the same resolution and I found the ZenPad 8.0 display to have the crisper text, which is logical considering the smaller 8-inch size. With most people needing this tablet for viewing websites, watching videos and playing games, the display delivers good results. If you’re playing a game or watching a video you’re not going to notice a dramatic difference in this display vs. higher resolution displays. It’s really only with text that a lower resolution is noticeable. Even at that, the 1280×720 resolution provides more than adequate reading and text clarity. I’ve been fortunate to have access to the other ZenPad tablets so I do have some basis for comparison. I want to also mention being realistic about battery life on this tablet is important. If you spend more money on a different tablet, you might find better battery life. However battery life is not the be-all-end-all that it used to be. External battery packs are something that I truly believe in and that will enable you to go worry free when you are away from a power outlet over an extended period of time. What’s better is that you can get the Power Case for the ZenPad 8.0 and that will deal with any battery life shortcomings. I ran the same range of battery tests on the ZenPad 8.0 as I’ve done on the ZenPad 10 and both models of the ZenPad S 8.0 (Z580CA and Z580C). I have a pretty good basis for comparison in this regard, but I also want to evaluate the ZenPad 8.0 on its own merits. I should also mention that my video tests were done using 720p quality videos run via the Kodi media player. What I can say is that playing video from local storage for 2 hours is going to drain the battery by about 48% to 56%. If you’re thinking that reducing screen brightness to 50% will provide a lot of battery savings, I can say this wasn’t really the case. You’re looking at maybe 4% battery savings over a 2 hour video if you dim the screen. In my gaming battery tests, you are likely to lose around 16% to 20% when playing 30 minutes of a resource hungry game such as Clash of Clans or Minecraft. It’s a bit odd to say this, but the difference between playing at 100% full brightness only made about a 2% difference than when playing at 50% brightness. Although I ran comparisons on 50% brightness vs. 100% brightness in my battery testing, I tried watching a video and playing some games with the brightness set to around 25% to 30%. It’s certainly fine at that level provided you’re out of a bright environment it would be a suitable option if you were in desperate need to squeeze more battery life out of the ZenPad 8.0 tablet. Standby battery usage is good on the ZenPad 8.0 tablet. I found that in overnight situations for around eight to nine hours without use, the battery would drain around 2%. 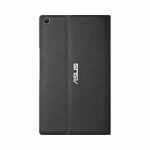 Asus also has easy to use and access power saving modes which can really save battery life when the tablet is sitting idle. On occasion during the review period I forgot a game running in the background during an overnight period. This goes for all devices and not just the ZenPad 8.0, but on one occasion I did wake up to 17% battery life when I had it at 100% before going to bed. The culprit? Minecraft was open in the background all night. This is fair warning that you risk draining the battery by a good amount if you leave certain apps open. On the ZenPad 8.0 especially, when you’re setting it down for a number of hours or overnight, make sure that you close out apps running in the background. The battery life of the ZenPad 8.0 at the time of writing is not the strongest feature of this tablet. It’s just not that great. 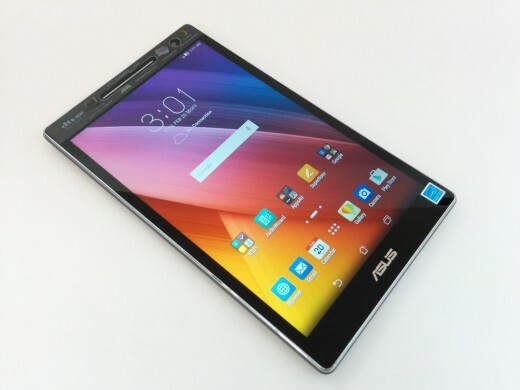 However I need to stress that Asus has been rolling out many software updates to their various ZenPad tablets and performance improvements and power savings have been part of those updates. I am expecting future updates for the ZenPad 8.0 to squeeze a bit more battery life and efficiency out of this tablet. 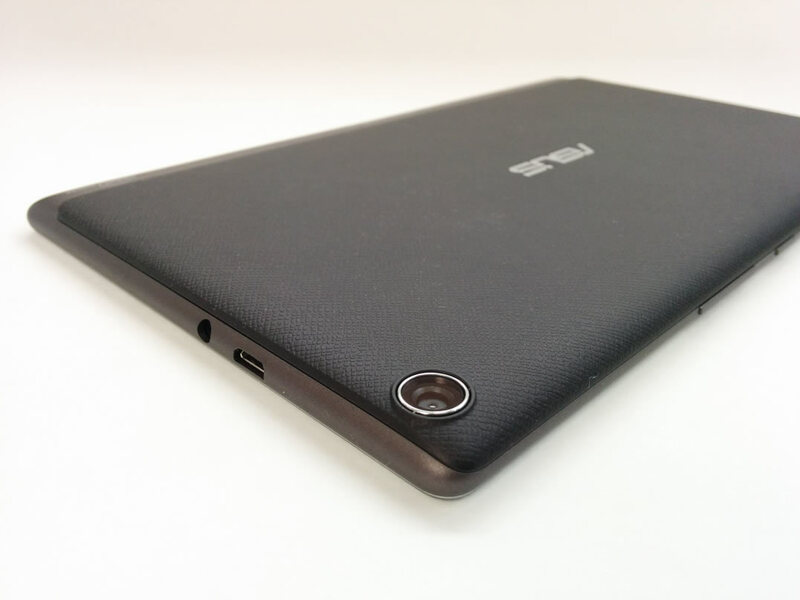 You have two excellent options for extending the battery life of the ZenPad 8.0 also. First, you could look at the very impressive Power Case which is part of the interchangeable design. This accessory costs $24.99 US. 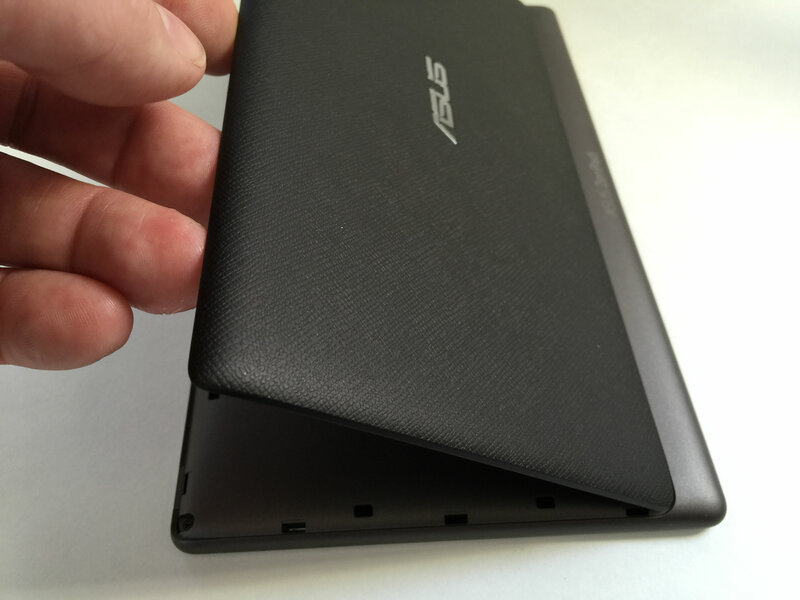 Another option is picking up a portable external battery pack which is versatile because it isn’t ZenPad 8 specific and you can charge other tablets and smartphones that use a USB cable for charging. Cost wise for an external battery pack, Asus sells the ZenPower power bank with 10050mAh for $19.99 US. As you may know already, a lot of tablets on the market feature side mounted or even rear facing speakers. 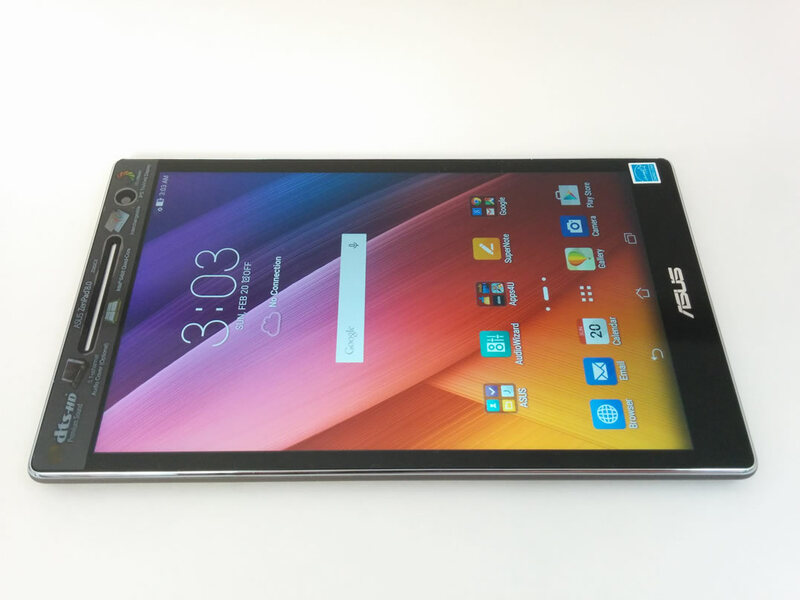 Thankfully Asus has dsigned every ZenPad tablet with front facing speakers. This is the way it should be! 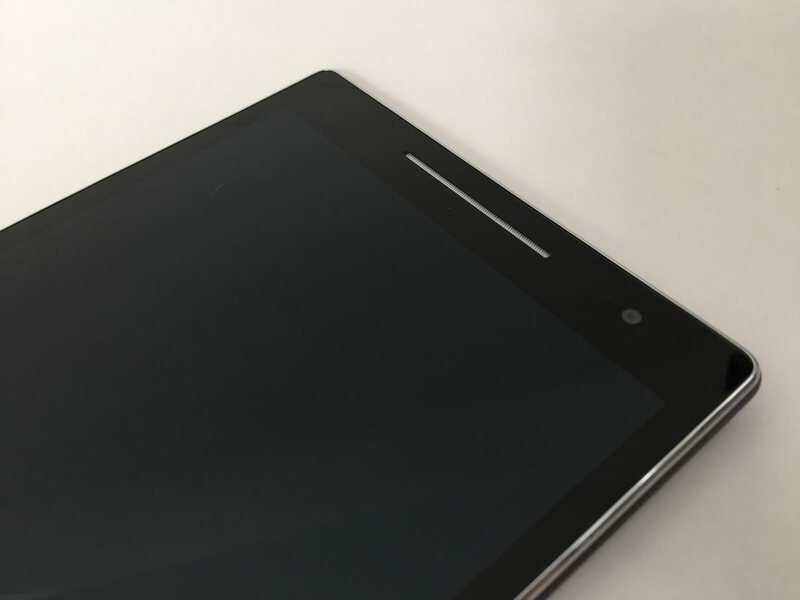 The ZenPad 8.0 features a front facing single speaker. A front facing speaker is always appreciated. I’m definitely going to rave about front facing speakers vs. side mounted or rear mounted speakers. Even if a front facing speaker lacks a bit of quality, I’m still in favor of a lesser sounding front speaker than I am of a slightly better sounding side or rear mounted speaker. So for me, I like the ZenPad 8.0 audio considering it’s a single speaker. It doesn’t have the dynamic depth of sound that the dual front facing stereo speakers as the ZenPad 10 and ZenPad S 8.0 tablets have, but it’s still excellent. Sheer volume is not top of the class. I’ve mentioned in other ZenPad reviews that lack of volume output can easily be rectified with using a media player that has a volume amplification setting. 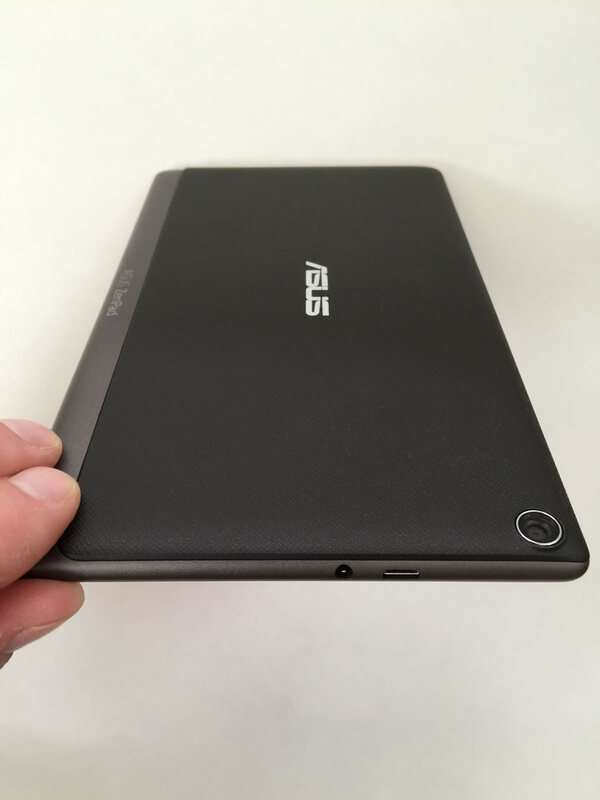 It does seem that Asus capped the volume in order to keep a clean sound, but in my tests the speaker on the ZenPad 8.0 can handle more volume. I tested audio through an external speaker and the results were stellar. No volume complaints in this instance. I would say depending on what I was playing through the external speaker, full volume was too loud for a room. No question the ZenPad 8.0 can pump out the volume under certain conditions. It’s very capable. A closer look at the speaker grill. The Asus Audio Wizard app comes pre installed and does offer some nice tweaks to the audio. The presets include movie, music, smart, gaming and vocal. Each one does offer up quite a different sound and it’s easy to choose based on what app or audio you’re listening to. The EQ is equally as useful and this is especially true when using headphones or an external speaker. If you like to tweak audio, the ZenPad 8.0 has you covered. With the low spec 2MP rear camera and 0.3MP front camera there really isn’t a lot to discuss. You will get limited use out of the cameras because of their low megapixel rating. For best results, you need a bright setting, preferably outdoors. If you’re indoors with dim lighting the photos will be grainy and blurry. Simple said I found it hard to focus the camera when in lower light situations. 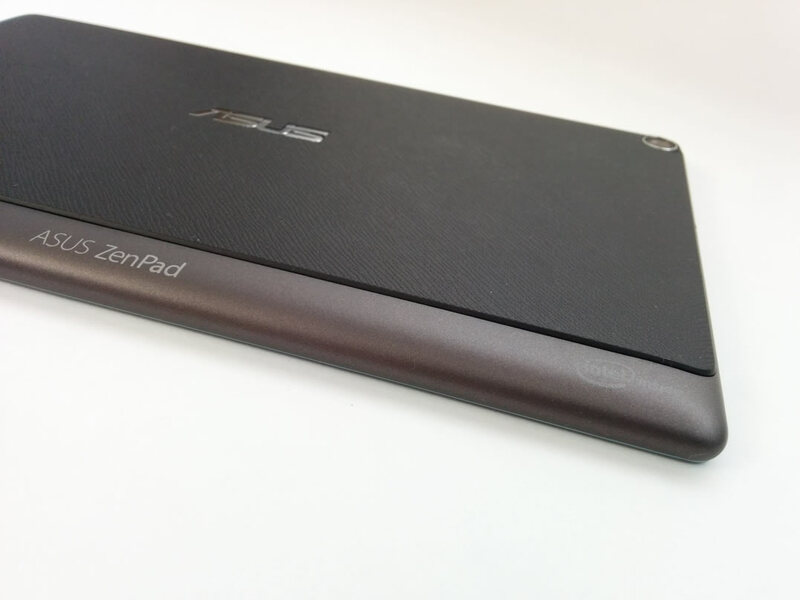 In our ZenPad 10 review we made the same point. It would have almost been nicer to have the 2MP camera in the front because that means a better quality video chat. How important is a tablet camera to you? Here is something to think about with the Z380CX and low quality cameras. My kids had a great time with the camera regardless of the low quality of the images. There is a good camera app from Asus (pre installed) which has a great selection of presets which are easy to understand and use. So I would at best consider the ZenPad 8.0 cameras to be kid friendly. If you are really disappointed with the camera specs, then think of it this way. Asus has a certain price point in mind. It would be either better cameras with 1GB of RAM or it would be 2GB of RAM and lesser camera quality. 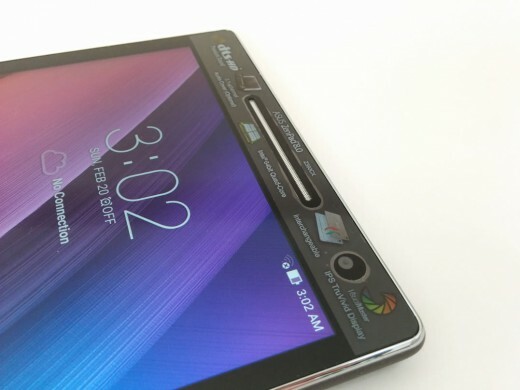 With great enthusiasm I will gladly take 2GB of RAM over better tablet camera specs. The extra RAM is far more beneficial on a daily basis and the performance of the tablet will be that much better. I’m all for it. 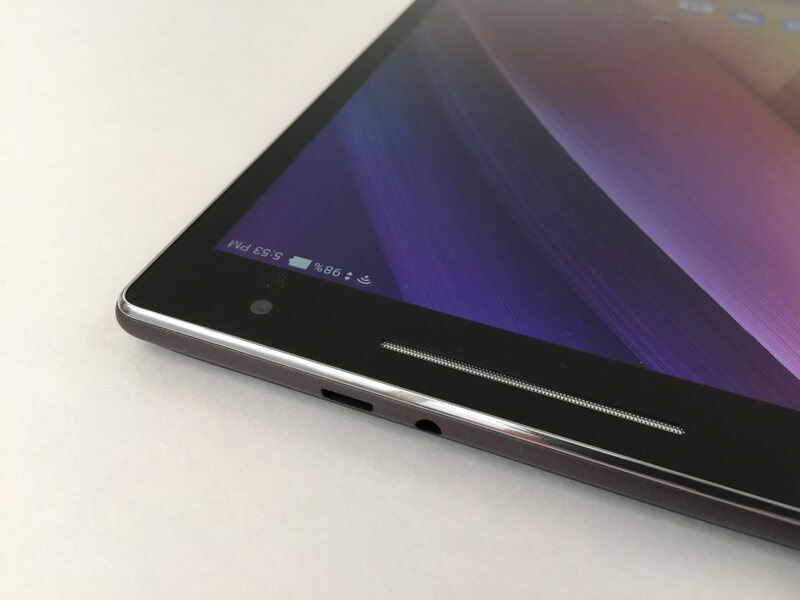 What’s most impressive about the ZenPad 8.0 aside from the great look and design of the tablet? Most definitely it’s the low price of $129 US. If you’re into color matching and accessories, then the ZenPad 8 interchangeable design is perfect for you. The interchangeable design is something that other competing tablets simply cannot offer. 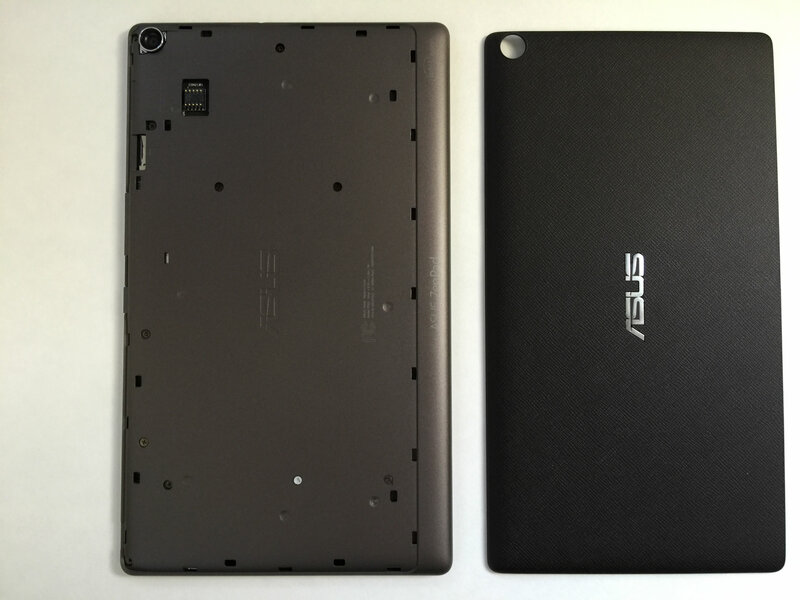 The ability to swap out the back plate and replace it with a different color cover (Zen Case), the Audio Cover or Power Case make the ZenPad 8.0 the most versatile 8-inch tablet on the market right now. The only real drawback I could find with the ZenPad 8.0 was in battery life. The processor seems less power efficient than what you find in the more expensive ZenPad S 8.0 models, but it’s by no means a deal breaker. Under normal usage conditions you will get through a day on a full charge. If battery life concerns you, there are three reasonable options: turn down the screen brightness to 50% or lower, buy the Power Case (battery inside) for $24 US, or get an external battery pack for $20 US or less. So if you’re looking for a reasonably priced 8-inch Android tablet that looks and feels like a premium device, then definitely consider the ZenPad 8.0. With the low price point the ZenPad 8.0 won’t beat out the higher priced competition in terms of benchmark tests or specifications, but as an overall package, it’s a solid value.